COLOR(S):Tan or yellow, with or without white markings. Portuguese Pointers are so affectionate and friendly that even in the AKC standards is a mention of their unwavering adoration of their masters. The breed is mentioned to be so affectionate that it is sometimes "inappropriate and inconvenient". 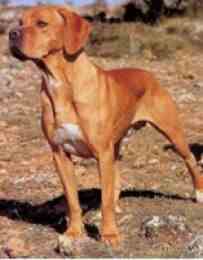 The Perdigueiro Portugueso, as it is also named, is a medium sized dog that may have been the progenitor of several other Pointer breeds. It is thought to have come before the English Pointer and contributed to its genes. They have short fur that is short and dense, and on the head it is velvety and soft. The coloration of the breed is from yellow to chestnut, sometimes with white markings in an Irish pattern. They have drop floppy ears and dark, large, sincere eyes. Their personality only magnifies their adorable appearance. They are, as stated before, overly affectionate and extremely dedicated to their owners. They are very obedient and submissive, and will retrieve or hunt anything commanded with the utmost joy. They are active dogs, tenacious and well-being. They thrive on physical contact and attention, and in return are intense hunters and highly trainable. Obedient, good with children and other dogs, the Portuguese Pointer is an all-around friendly hunting dog for the family. Affectionate, friendly and attentive, the Portuguese Pointer doubles from a gun dog to a home pet. They are speedy, skilled and have an excellent nose. They are intelligent and highly enjoy the hunt or retrieve. Perdigueiro Portuguesos are active, intense in their hunting and tenacious. With family they much enjoy doing as told, and are submissive and kind. They are very versatile and can bend to their master\'s requests. They are gentle and committed. They are highly trainable. Although affectionate, they are naturally serious dogs. They adore family. This breed is said to need constant physical stimulation, such as petting and playing with their owners. The AKC standard book mentions that Portuguese Pointers can sometimes be overbearingly affectionate to the point that it is "embarrassing", and the dog should be trained to restrain itself. he Portuguese Pointer needs to have a rub down and brushed every few days to keep them looking in top condition. Grooming is very low maintenance on the short coats. For the long coated variety, brushing should occur more often to keep tangles and debris out of the fur, especially the ears, since the fur is long on the ears. Albinism has been known to be a problem in this breed. This breed loves to be in the outdoors, but will gladly double as a house dog. They also have high demands of attention and energy, and therefore an apartment is probably not the best option. The best owner for this breed would be an active family living in a suburban or rural area. Perdigueiro Portuguesos are highly trainable, making it a point to do as their master says. They exude great joy in retrieving and hunting, as well as doing anything to please their master.